TERRENCE HUTTON is of counsel at Howe & Hutton, Ltd. He graduated from the University of Notre Dame with a BBA, and from the Northwestern University School of Law with honors where he was a member of the Law Review and Order of the Coif. He is a four-year veteran of the U.S. Navy, leaving active duty as a Lieutenant, with tours aboard a Pacific Fleet destroyer and with the U. S. naval forces in Vietnam. He also worked at the National Bank of Detroit before and RCA following his naval service. 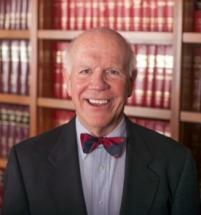 He has represented over fifty trade associations and professional societies. He has been a presenter at Association Forum, ASAE, NYSAE, SLSAE and CSAE, and at numerous association and hospitality industry meetings. He is a member of the Chicago Bar Association. His principal area of practice is the general representation of associations and professional societies, with concentration in corporate, contract, employment and antitrust law, litigation, and consulting on association governance matters. He is also editor of the firm's monthly newsletter, The Howe & Hutton Report.